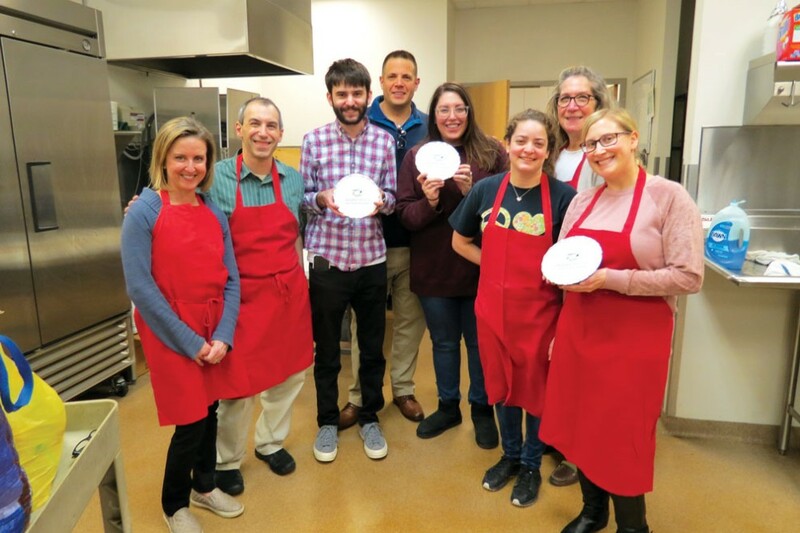 Volunteers from the Young Adult Division of the Jewish Federation came together with Jewish Family Service on March 18 for a mitzvah project to benefit older adults. They sliced cucumbers and tomatoes for a simple salad, layered noodles, sauce and cheese for lasagna, blanched green beans for a side and filled and folded hamentaschen for dessert. A fresh tuna salad and challah roll accounted for the following day’s lunch. Together, the volunteers prepared 40 “Mazel Meals” to be delivered to older adults across the Lehigh Valley. “What you’re doing is a really big deal because there is nothing like a home-cooked meal to make someone feel loved and remembered,” Chelsea Karp, volunteer coordinator for JFS, told the volunteers. The following morning, a new group of volunteers arrived at JFS to pick up the meals and bring them out for delivery in Allentown, Bethlehem and Easton. Is your group or organization interested in partnering with Jewish Family Service to prepare Mazel Meals? Contact Chelsea Karp at 610-821-8722 or ckarp@jfslv.org to learn more.